A couple weeks ago I was at an Allagash tasting, it has inspired me to do this weeks Beer Brawl™. I really enjoyed all the beer that I had at the Iron Monkey tasting, so I wanted to share that experience with you. With me on this podcast was Corey Greenberg, Mike Kivowitz from Leafy Green.info, Teri Gatto, and James Nash . The only prerequisite I have for these Beer Brawls™ is a love of beer. You don’t need to know anything about the beers we are drinking only a willingness to try them and voice an opinion. I almost feel as I was blessed with this line up of beer, while the beer was pretty pricey, each beer was unique and a pleasure to drink. It is rare that I get to say that in a podcast. The Victoria Ale, from the Allagash tribute line, was a great way to start off. This beer, at 9% alcohol, was clean and dry with a slight tang. It was about as close to a chardonnay as a beer can get while still being a beer. The Confluence was one of the favorites of the night. If you haven’t had this beer your missing out. An amazing blend of sweet and tart that is so refreshing, especially on a hot day. The other favorite of the night was the Curieux. This is the Allagash Trippel aged in Jim Bean Barrels. Wow, what a beer. Having an amazing base beer to start with really allows the full potential of oak aging to come together. Unfortunately for us the Black was the let down of the bunch, while an OK stout it just wasn’t up to the caliber of the other beers. We found it over carbonated and thin and the color was that of brown ale. Rounding out the Night was the second tribute beer, the Hugh Malone Ale. This was a well balanced belgian IPA, good use of some aggressive hops with out going overboard. Overall I’m extremely impressed by the quality of the beer from Allagash. I can wait to try some of their new beer. Hopefully we’ll get a chance to try some of the “wild yeast” beer. 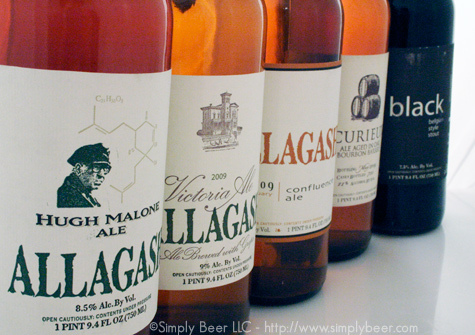 Allagash, send us some beer!!! Download the podcast and listen to all the details about these craft brews stacked up against each other. Beer Brawl™ 22 will be taking us on the road again to the Liquor Outlet and Wine Cellar in Boonton NJ, where Kevin has selected, as he puts it “Obscure Lagers”. I’m excited to see what he has in store for us! Thanks for the invite, it was a pleasure and yes, you need to download this podcast!